Is imitation really the sincerest form of flattery, or am I just ripping you off? I was at a friend’s rezday bash last weekend and spotted Lorenn Pera wearing a really lovely crochet top. She very graciously shared the LM of Son!a, a store that has been around for quite a while, but was new to me. I finally got over to the shop a couple of days ago, and really enjoyed browsing the mix and match casual section. I picked up several things, hopefully the subject of future posts, but decided to lead with the crochet top Lorenn was wearing. In a different color, though, so it’s, ummmm… a “tribute” and not a rip-off, right? I hope so, anyway. I paired it with a skirt from a really nice outfit Malt had at the last FFL. Styling info and more photos after the break. Ahhhh..the crisp, cool, air….the fiery color of leaves on the hillside… no, strike that. At least not in this part of the world, and not at this time of year. 90 degree heat. Higher humidity. The stink of a crowd pressed too close together and the “eewwww” as the guy in the row behind you, who has been drinking since 10:00 in the morning, sloshes his Coca-Cola laced with bourbon down your back. One of my favorite installments of the old HBO series “From the Earth to the Moon” is the episode entitled “Galileo Was Right,” which dealt, in part with how a bunch of pilots were trained to act as lunar field geologists and learned to spot the right rocks during their limited time on the moon. The mantra became “Get the unusual one.” Anyone who has wandered the grid for any length of time can happily list the “ohhhhhh” moments when you stumble across something really interesting that you have not seen before. That happened to me a couple of weeks ago during the Ivalde sim hunt when I wandered into Aurora Borealis and saw the jewelry sets made from pieces of patchwork quilts and the beautiful pearl jewelry. Last week I was wading through a backlog of IMs and group notices and saw an interesting blurb in Fashcon from a store I had not heard of before. The flyer was advertising bustiers for what seemed a pretty reasonable price, but what I really noticed was the bright colors. I’m not sure one can rightly call it spring fever when one lives in a subtropical climate, but I decided to go check out Vivium. Kris Svenska’s cOre sim continues to grow, and she is celebrating today with a party from 9:00 a.m. to 11:00 a.m. slt. 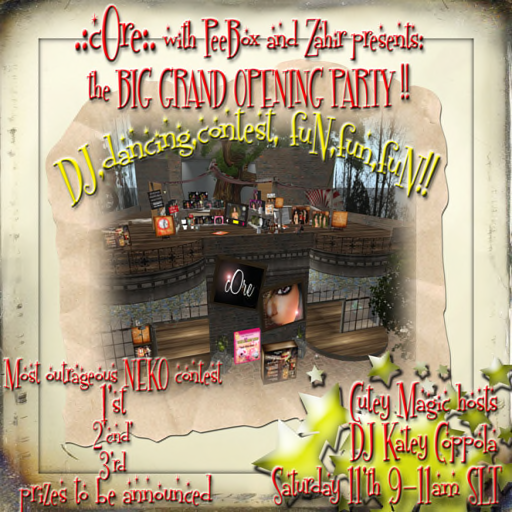 Come boogie with DJ Katey Coppola, check out the cute build and the new shops, and stick around for the groovy prizes! There will be a contest for most outrageous Neko, so dig out those ears and tail, already! When: 9 am to 11 am SLT Saturday 11 April TODAY! I love shape and skin hopping. After almost a year in-world I still very much enjoy the playing with paper dolls aspect of SL. I was lucky enough to win a major shape store’s big drawing my first week in SL, and I have at least half a zillion (yes, I counted) skins, demo skins, freebie skins, spam, eggs, bacon, spam and skins in my inventory, including a variety of ethnic skins I have played with from time to time. Nothing ever looked quite right, and many of the shapes I tried seemed overly exaggerated. About ten days ago I saw an interesting post by Khitten Kurka mentioning the Kiko Life sim. I went to check it out and was immediately impressed by what I saw on the adboards. The shapes themselves were curvy and quite lovely, but I was particularly impressed with the time Kiko had spent on the faces. Full, but very, very pretty. Kiko himself happened to be in the store when I stopped by, and he was extremely friendly and helpful as I dithered, finally deciding on the Oyadele shape. When I first met Kristya Svenska she was relatively new to SL and had her own photo studio. We also happened to have been pretty much twins, having both independently chosen the same shape and skin. We have kept up with each other through mutual friends, and I recently heard that Kris had gone all buildery and now had her own store, . :CORE:.